The Be Like Bill meme has taken social by storm. 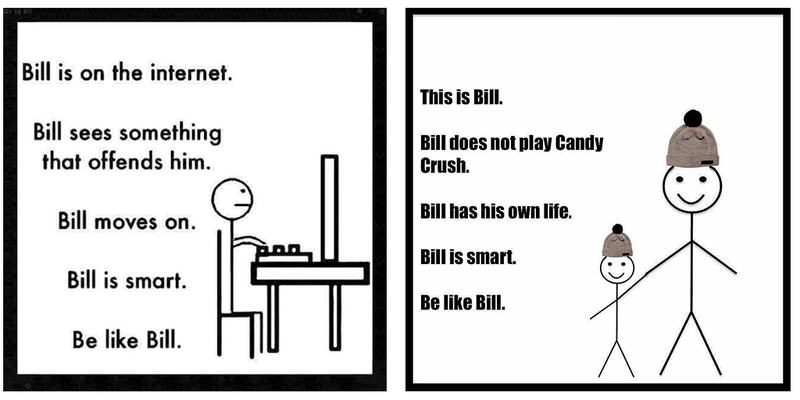 At the core of the phenomenon, created by internet gaming enthusiast Eugeniu Croitoru, is its official facebook page, Be Like Bill. Since its first post on January 7th, the page has racked up over 1.5 million likes. We followed Bill on his social journey – the rise, the fall and the rebirth. Although the Facebook page was created in late 2015, Radarly saw a significant spike in the number of Bill mentions on Monday 11th January, following a Be like Bill discussion on Reddit. 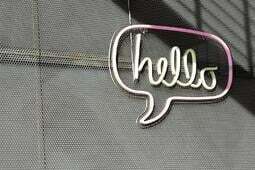 Since that day, conversation has accelerated, and in just two weeks Bill became a social phenomenon. The original advice given by Bill focused on social media etiquette, and it was given with a hint of sarcastic wit. This charismatic approach triggered conversation across twitter, forums and the media but in particular, Facebook. The direct and honest stick figure quickly became known and loved - attracting positive media, brand and user attention. The trend was immediately discovered by internet media company, Buzzfeed. Our analysis shows that initially, positive conversation sentiment was 3 times higher than negative. 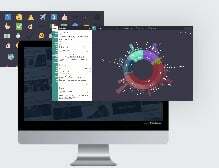 Software company BloBla capitalised on the development of their Be Like Bill generator. The generator allows users to enter their name and gender and voilà – their Bill story is (randomly) generated! In just one click, a personalised Bill meme can be shared to Facebook. The restriction of user input kept content regimented at the same time as offering a new type of exposure for the meme. Big brands realised the popularity and virality of Bill and instantly hijacked the trend, using it to promote their products and services. Respected sectors employed Bill as a social media campaigner. 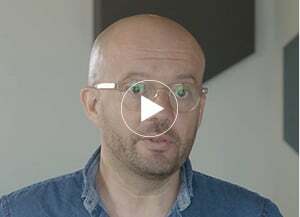 The simple stick man flourished, becoming the face for brands and organisations – charities, supermarkets, the police force – the Bill meme was everywhere. Over 120 countries participated in online Bill discussion. Bill's traction was higher in the UK than anywhere else. Key influencer, British online fashion and beauty store ASOS.com hosted an interview with Bill’s creator. The tweet linking to the interview reached almost 75,000 twitter users. The meme was culturally adapted across the world and alternative names were created in different languages, for example – Bilal. Due to the simplistic style of the meme, users took Bill into their own creative hands. 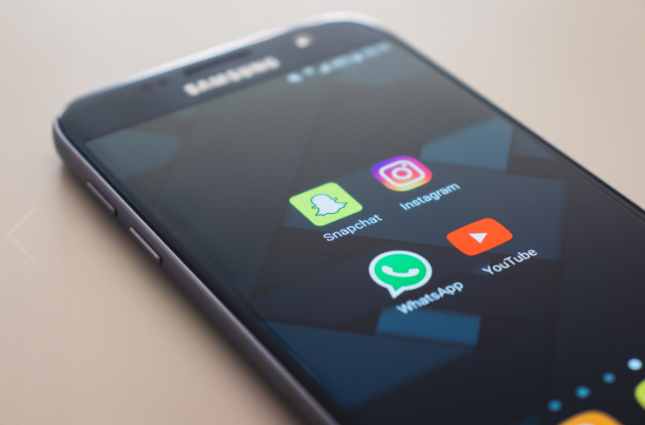 While a share of messages were harmless, others were not – some memes included sensitive topics with mentions of ISIS and war. 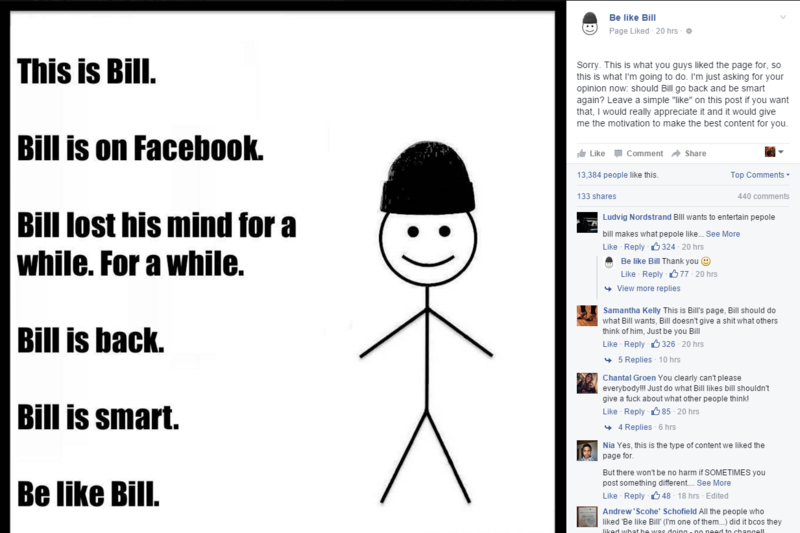 The Be Like Bill phenomenon quickly escalated through high volumes of shares, comments and likes. 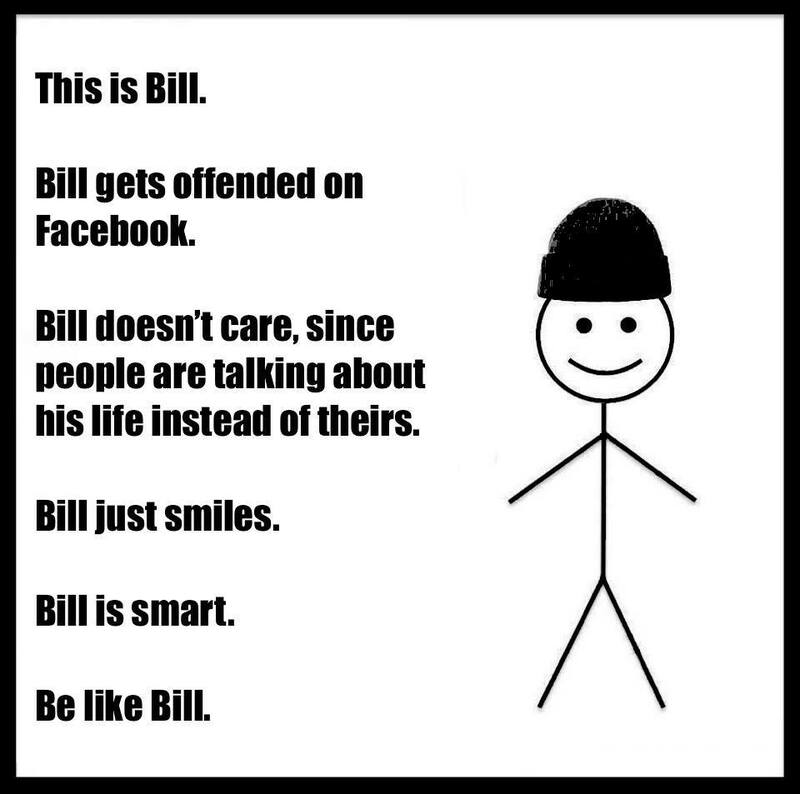 The official Facebook page encourages users to message the page with their Be Like Bill thoughts. The better content is then reformatted into the Bill-style meme and published on the page. 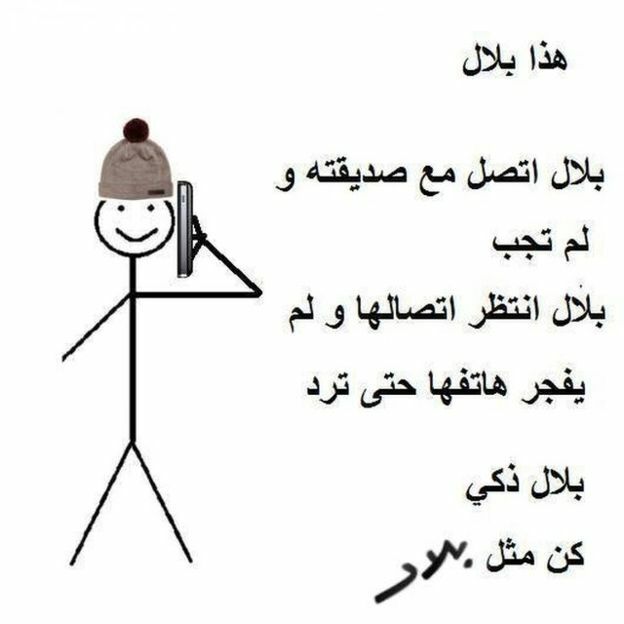 The messages varied, from tongue in cheek humour discussing good boyfriend qualities to what can be deemed as, offensive posts – these were approved and published by the official page, causing a social uproar. The variation of offensive memes ignited criticism and comments across social platforms causing a divide between fans and critics, Bill became the social media marmite. As both user generated and Bill generated memes spread further, positive sentiment decreased. The second week (19th – 25th Jan) told a different story to the first. 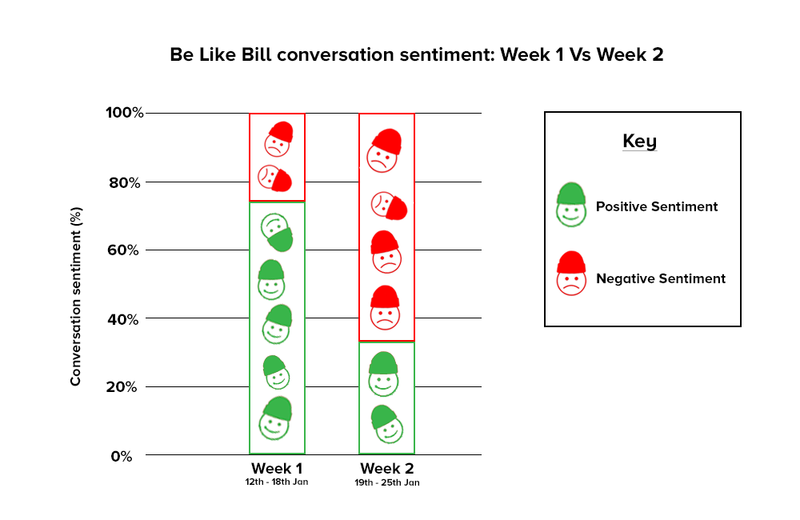 Negative sentiment doubled the value of positive sentiment in the second week, with positivity only fuelling a third of conversation. Internet users became raged and irritated by Bill and it did not go unnoticed by the media either. The Independent tweeted (including retweets) 20 times in the second week about the ‘mockery’ and ‘hatred’ for the meme. In protest, a counter meme was made, Don’t Be Like Bill. 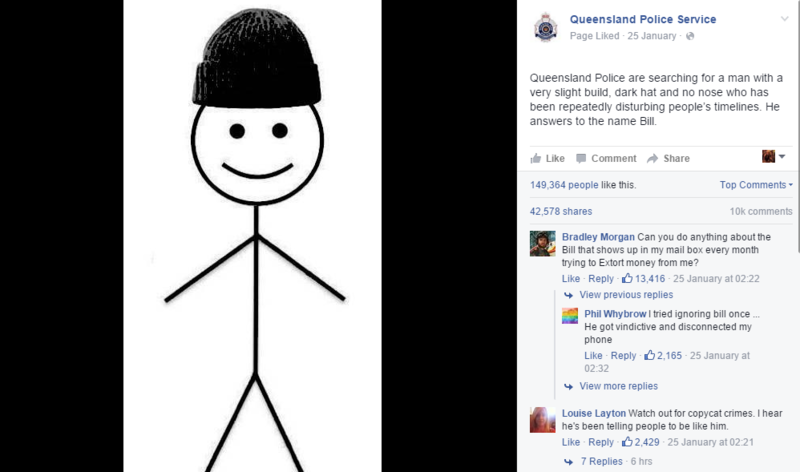 One of the most viral social media posts was a Facebook status from Queensland Police Service (Australia) acknowledging the irritation caused by the craze. It harvested almost 43,000 shares and nearly 150,000 likes in just 48 hours. On the 26th of January, the Be Like Bill official Facebook page posted an apology for tasteless content. The day before the apology, there was 2 times more negative sentiment than positive. On the day of the apology, positive sentiment exceeded the negative, proposing that the approach to tackling the social crisis was an effective one. Fans replied to the post with comments supporting the meme, and justifying its actions. 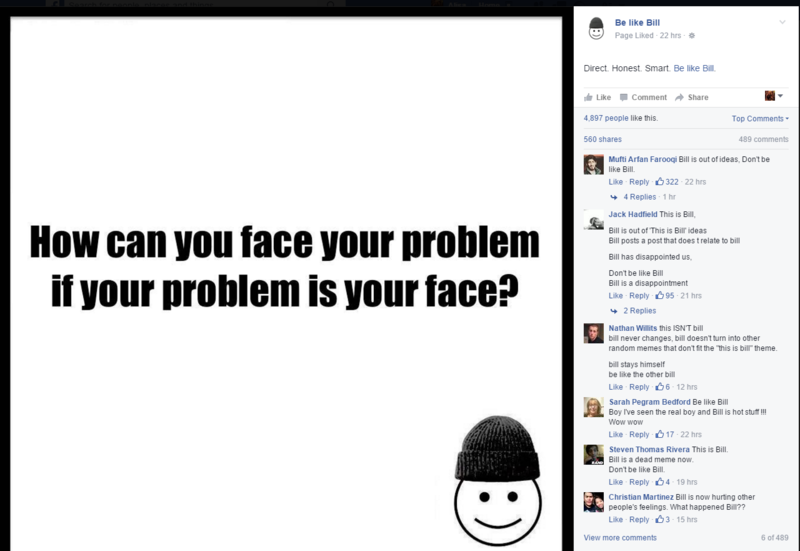 Following the apology, the page released a post in original Bill style, redefining the sense of the meme – advising on social etiquette. Bill accepted his downfall and focused on his new journey, still with a hint of sarcastic wit. It’s going to be very interesting to see how the online community continues to react to the meme, considering the social rollercoaster so far. On Reddit, the initial cause of popularity for Bill, users discuss the short lifespan of Facebook memes, and forecast a short future for Bill. It brings to question - is Bill really smart? Smart enough to live on? 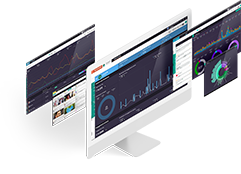 To find out about more about our social media monitoring tool Radarly, please request a demo here.